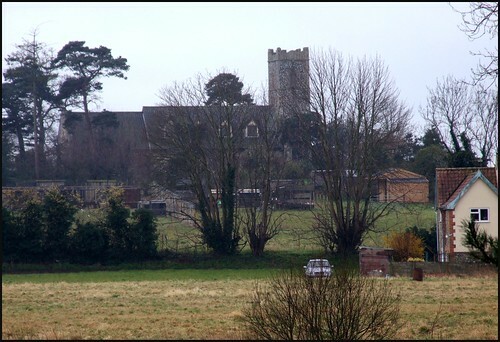 All Saints, Knettishall, is one of a number of churches in north Suffolk that fell into disuse and dereliction in the early years of the 20th century. At least one of them, Linstead Magna, has now disappeared completely. Little Livermere is a wild ruin, and Stanton St John a sanitised shell in a cemetery. All Saints has suffered a kinder fate. Its interior furnishings were dispersed in 1933, mainly to Riddlesworth, half a mile away over the Norfolk border. Cautley visited All Saints that year, and found it smothered in ivy, and its thatched roof decayed. Cautley made an inventory of the fittings that were taken out, which is probably worth repeating here:A fine set of Charles I arms with the 1632 overpainted 1666, a Stuart pulpit, the three-sided Laudian communion rails, a late Stuart holy table and font cover, an 18th century chair, and two painted panels, one of St Edmund and one of St Peter. Cautley thought these had originally come from a reredos. The font went to Lakenham, also in Norfolk. At that time, the decalogue boards, dated 2nd May 1789, still hung in the chancel. The church was marooned on the Coney Weston USAF base throughout the Second World War and into the fifties. Pevsner, visiting in the late fifties, found it disused and decaying, and Cautley's editors found it the same in the early seventies. Today, All Saints sits proudly on the edge of the former airbase, its tower gap-toothed but secure, and a large house built into the lower walls of the former nave. The original windows have mostly been reglazed; obviously, you wouldn't want too many churches to end up looking like this, but it is all done rather well, with a row of dormer windows built into the roof. The owners allow pre-arranged access to those wishing to tend the handful of surviving graves, but otherwise, this is private land. Never mind, because the road across the former airbase passes right beside the western face of the 15th century tower. This is a curious place, incidentally. There are no hedges on the former airfield, but a thick band of conifers has been planted along the line of the runway. It must look spectacular from the air. On the ground, it forms a wall across this borderland, cutting the parish off from the rest of Suffolk. The Norfolk border lies a few hundred yards beyond All Saints, and across the valley you can see half a dozen fine towers. But they are all in Norfolk.